I got a chance to try a pair of these for a bunch of runs yesterday on NH "firm" conditions, and came away impressed. When I first saw the brand and the price, I didn't know anything about them, and just figured they were another VT company doing the "local" thing and charging a premium for it. Somehow I missed that they were FIS-compliant race skis until they were on my feet, at which point it became pretty hard to miss. The marketing says "Extremely Stiff, Torsionally Rigid, World Cup Quality". I don't have a ton of experience with different race skis, but these were quite noticeably stiffer than the other SL skis I've ridden. For a punter like me, that made them awesome for free-skiing, though I'd imagine you'd have to be pretty darned good to manage them in the gates. As far as torsional rigidity goes, these things were ridiculous; it was like they had infinite grip. They had such a solid feel, I completely forgot that my friends and I had been keeping a lookout for shiny snow just one run before, and felt free to just play with turn shape and rebound. I have no idea what "World Cup Quality" is, but if this is it, I'm going to start envying top racers a lot more. I guess the way these felt to me were like an SL ski turned up to 11. I'd never been on a ski that felt quite like this, and my plan to pick up a $200 pair of used SL skis for periodic usage as ice skates is currently being reconsidered. Why would I even look at a ski that retails for 8x that, without a plate or binding? Yeah, these were that good..
Dan, I can't speak to this brand of WC slalom ski and I am glad you loved them. I can say that what you will get from a Head or Fischer RD ski is something similar and oh so much fun. Many of these can be had new for $400-500. I actually think with race skis you are better off buying new as the skis lose their pop after 40-50 days and many used skis you may buy have at least that many days on them. The ski would have to bring my skiing up several levels (permanently!!) for me to pay $1600 for it!! John, I think you said that once upon a time about Dodge boots didn't you?? Yes, but the Dodges did exactly that!! I know, and that was the point (sort of ). I was hearing the same amazement in Dan's "voice" that you had in your's when you told us about the Dodge boots. IIRC, you were absolutely amazed that they improved your skiing and feel for the snow so much!! Any suggestions on when/how to get i.sl rd for that price as a non-racer? btw, Dan has been on other real slalom skis before from the same source -- he's plugged into 'pmts east.' 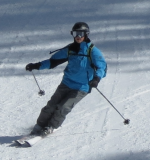 Glen was on these B-1 skis and speaking well of them at Sugarbush the other week. Anyone can be a USSA member and then you can get member pricing at any shop that gives racer discounts. I pay my dues every year but most places never even ask for your number. I also see lots of RD slalom skis on sale at deep discounts on Ebay. I can't always find the Heads but Fischer RD skis are always available in abundant supply at big discounts (as well as other brands). Thanks. It never occurred to me that literally anyone could be a USSA member. Boy do I feel stupid. The only time I've gotten a racer discount before was when I skied new gear with the seller who then gave me the discount based on my skiing. You know how, the first time you get on RD skis, you have this incredible sensation of power and grip and "holy crap these things rock"? That's the feeling I got on these, except that I already own an i.GS RD, and have skied RD SL's. From what I understand, the idea behind the company is to make real skis available to North American racers who can't get them otherwise. Anybody can buy normal RD skis anywhere, but in order to get the real-deal special ones, racers have to be sponsored and lucky enough to get their hands on them. My understanding is that most of the special ones go to European racers, so the guys here get whatever's left and there aren't enough to go around, so there's a bunch of guys out there who want these skis, but literally can't buy them. Bomber is looking to solve that by making skis at that level and selling them to anybody who's got the cash, and is working with an ex-Rossi race room guy to get them built. I admittedly haven't been on a pair of RD SL's in a while, but where I've previously felt that SL's were soft and super-forgiving, these were not soft, and seemed to be asking to be cranked up on edge and run hard. It was like driving your buddy's new exotic car that clearly needs a driver better than you to get into its stride. I'm tempted to save my pennies for a pair just to keep myself honest and learn how to work them. Anyway, I hadn't seen much about these in the way of reviews yet, so hoped putting this up would prompt one of you guys who gets on a lot more skis than I do to try a pair if you see them, and write a much better review. Is the USSA discount on a pair of skis usually more than the fee for a year's membership? Your comments about the B-1 now make me wish I had been able to stay longer at Sugarbush on Sunday. Glen was planning to put me on them in the afternoon. I guess I will have to make a trip to Waterville Valley to try them. My current Head SS's are nearing the end of their life . Hence my skiing on the Vists. The Vists were significantly more damp and less lively than the SS's. Also wider under foot (72mm I think) and a little longer radius (~13 m). Glad you liked the B-1s. If you get a pair, can I try them? Of course! I'm always happy to swap skis for a bit with anybody who shares my BSL, subject to the usual provisos regarding rock-ski days. Let me play in the Sl ski thread for a little bit. Today, I was out on my Blizzard Sl's and just kept smiling all day long. I can carve and control this ski so much better than any thing I own. Helluva told me a few years ago that he's not a fan of this ski, and, he tells me that a morning on his Fischer SL's is a lot of work and requires great concentration. 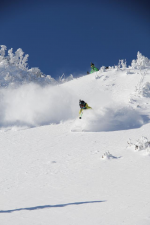 I believe him and would want to actually ski full bore WC Sl ski just for the experience. Not something I'd buy on a whim. My Blizzi's, in 165, just perform as long as they stay on edge. Fast edge to edge, but, also easy to transition into brushed turns. So, I doubt they are in the class that Dan, Max, Helluva and JB describe in talking about a WC Sl, much closer to de-tuned carver. After 4 plus hours, it's time to change to something much more comfortable to ski. The Sl ski experience is not making my potential choices about a 'Shape replacement any easier. An absolutely meaningless story is that the best technical skier and racer that I ski with on a regular basis, skis the same ski in an older version and just leaves RR tracks on steep, icy headwalls. He bought it at a yard sale and his Nastar handicap is far lower than mine. 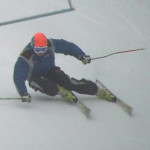 Edge hold, quickness, angles, gravity, g-forces....re-inforcing solid ski skills....ALL great stuff! The majority of non-racers that get on a race stock SL end up making GS turns. That's why they sell SL skis to the general public. If they didn't, everyone would just make SG and DH turns. lol this is so funny. MY SL ski feel like my legs will rip off prior to ever getting to turn that big. I have skied them for 80k vertical feet in one day before making SL turns because they are sketchy at anything bigger. Ok, as head of the Statistics Verification Board I need to confirm that number as 80,000 vertical feet, aka 15 miles, aka 80 runs on a 1000 vertical foot trail/hill. Many times, that's a hard WEEK of skiing for me! Are we talking pure bred Slalom gate skis or a ski with a 11-13 meter turning radius. I don't agree that all skiers with a slalom type ski make GS turns....way to nondescript. Being playful on the mountain on a 13 meter carving ski means you might be making short turns carvers, medium and GS turns depending on traffic. The product line offered to the general public offer lots of turn shape versatility in that turn radius range. IMO....No matter what ski you have on the feet....you gotta have the tools that allow you to maximize it's performance....and then some. Gate skis. Pedestrian skiers can't bend them. I only use "SL" or "GS" to refer to gate skis. I call the consumer models short-radius carvers. That is good terminology. With the performance of most all mountain carvers these days I'm not sure why a non racer would want a true SL or GS ski. They aren't particularly versatile. With the performance of most all mountain carvers these days I'm not sure why a non racer would want a true SL or GS ski. They aren't particularly versatile. They're really fun for going fast on the right surface, though. If I could afford a Formula One car and had someplace to park it, I'd buy one of those, too.. Formula One cars weren't meant to be parked.